Too Late The democrats are enacting marxist laws. They are ignoring the minority party for the most part and now have enacted a "cap and trade" bill without even telling the minority party what is in the bill. So what's the problem with that? Nothing really. The election was in November. Our form of government works this way. November is the time for voters to prevent such abuse. We didn't. We gave one party absolute control of the government. There's not much we can do about it now. I heard one obnoxious right-wing radio guy (Hannity, whom I can't stand) rail on and on about how you have to call your congressman and help stop this. But it's too late for that. They can do whatever they want without regard for voters. And I'm sick to my stomach. Remote Control I just got back from my two weeks of annual training with the Marine Corps out in the mountains of Central California. It was a large operation, larger than in recent memory for the reserves. Along with the predictable command and control and logistics training, we also helped defense contractors exhibit new technology. In particular, we had a remote control helicopter flying supplies to one of our companies. It's also designed to be able to fly out wounded Marines. I can't tell you how bad an idea this is. 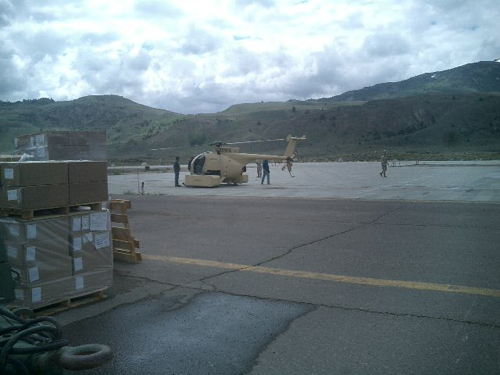 Here's a picture of the helicopter drone shortly before it accidentally dumped its cargo at the end of the airfield, narrowly missing bystanders as boxes tumbled to the ground. As my dad reminded me, remote control helicopters aren't a new idea. We just have better controls nowadays. At Hawthorne Army Depot while in retrograde to Houston, I saw where some remote control armored vehicles were being tested. Now, I'm all in favor of remote control surveillance aircraft. I'm in favor of remote control explosives ordnance demolition vehicles. But I find it deeply unsettling that so much effort is being spent on remote control resupply vehicles or medivac vehicles. Imagine you're in a rifle company that's getting shot at. You already probably feel pretty isolated and forgotten by the world, and now you're being delivered supplies by a robot. Your government seems to think that it's okay for you to be in danger, but the danger is too great for someone to simply visit by bringing in supplies. Remote control vehicles to resupply infantry units are a bad idea because they announce that the government doesn't mind spending tons of money developing and buying systems that keep precious pilots, officers, from getting shot at. The expensive equipment is expendable, but that precious officer flying it is not – because that precious officer is more important than the lance corporals and privates that are told to go into harm's way. The biggest danger with remote control resupply and medivac vehicles is that it would encourage leaders, politicians and those with decision authority, to put our Marines at greater risk and deeper isolation, making them more likely to be expendable. Besides, the main strength of a military, as is proven again and again over the millenia and even in our current wars, is that continuity in military presence across terrain is vitally important. Isolated military presence is of limited value and can be easily over run or ignored by a determined enemy. The Viet Nam War era way of fighting wars on the cheap, as though the military were a business, has contaminated our war fighting to this day. Rumsfeld wanted to fight the wars with the optimum and minimum number of forces required, with the result that he often underestimated requirements. Now the military is treating the military like a factory, trying to reduce costs by reducing manpower. Fighting a war is not like running a union-controlled factory. Manpower is vital. War is personal. Trying to pretend otherwise lost us the war in Viet Nam, almost lost the war in Iraq, and has caused the war in Afghanistan to flounder. We need to forget foolish projects like remote control helos for resupply and concentrate on keeping units resupplied by truck or manned helos if there's an emergency – not just because it sends a bad message to the men doing the fighting, but because that is the symptom of an ideology that fails to understand what war is and how wars are won. War is personal. The purpose of war is to inflict our will on another population. Our will is inflicted by people, not by robots. Who's to blame for Venezuela? The mayor of the city of Carracas says that Venezuela is now a dictatorship. Whose fault is it? It's easy to point a finger and blame the dictator. And to be sure the dictator is the focus of the blame, but his guilt doesn't absolve the rest of the guilty. One man can't be a dictator. It's impossible. Not even a small cadre can do it, especially in a country with a tradition of democracy, individual rights and property rights. Chavez can only be a dictator with the support of a lot of people. Maybe not a majority of the people, but still it takes a lot of supporters to be a dictator. Some might support the dictator from love for him. Some might support him for a desire to share in the spoils. Some might support him out of apathy. And some might support him out of fear. Regardless, these supporters are all equally guilty. Fear is no reason to excuse guilt. We might sympathize with those in fear, but we should never excuse their crime. A variation on this theme is the blame for the situation in Iran. There are many, many people who buy into the theory that the United States orchestrated the rise to power of the Shah. This is preposterous on its face. There are millions of people living in Iran. A handful of American agents cannot create power over those millions without the acquiescence and active support of a sizable part of the population. Whenever a population chooses to resist the CIA in regime change, they succeed without a sweat. Cuba still is communist. Iraq's dictator did not fall until we brought in a few divisions of soldiers and Marines. A people are responsible for the government they allow to rule them. This has always been true, whether the people understood it or not. It is a hallmark of modern international law, and the reason for its failure to encourage peace in the Middle East and everywhere it is applied, that people are held blameless for their government's actions. If the people of a nation were held to be accountable for the evils perpetrated by that nation, there would be fewer dictatorships around. Venezuelans may not, as a majority, support their dictator, but many do. The people in the best position to do something about a dictatorship are the people supporting him. When their peers fail to act, they have no one to blame but themselves. Who's to blame for Venezuela? The people of Venezuela, that's who. Blogging has been light because I'm in a continuous state of disbelief as to what has been happening in our nation. The clearest indication that my reaction is proper is provided by the former Soviet state newspaper, Pravda which declares that the United States is rushing headlong into Marxism. So I guess my stunned reaction is not so undeserved.